I love finding new beauty products or tools for myself. I treat my hair as if it was my child, I know that probably sounds strange. Don't judge me though! Every since I've been on a natural hair journey I look for products that will be beneficial. All of the items I brought are specifically for my hair, except for one. Oil is very essential for my hair, especially at the ends of it. That's where my hair tends to be the driest. Both oils provide moisture for the hair and scalp. It helps dry and brittle hair. These products promote hair growth and can be used in protective hairstyles (braids/twists). Before I wash my hair I use one of the oils. This can also be warmed up as an hot oil treatment too, and use before washing as well. These little bottles only cost $1 at Walmart, so sometimes I buy more than more. These makeup wipes are work really good. At first I wasn't sure whether or not it would work, but I was wrong. These wipes remove long lasting makeup. Most importantly it's alcohol and Oil free. Enriched with Aloe, Green Tea and Cucumber all key elements for nice skin. I love how 30 wipes come in a pack. I'm comparison to brands that only supply 10 wipes. I brought two packs for under $3 at Walmart! Another good thing about the wipes is there's no harsh feeling during or after use. This brush is used for smoothing and styling the hair and it's suitable for all types of hair. It says that the brush has rounded ended pins for gentle styling. This should be good, because I don't like brushes that pull my hair. I found this brush on Amazon for about $12 not including shipping, handling and tax. I have not tried the Denman brush, but I've seen a lot of people use it on YouTube. I brought it because I wanted to make my curls more defined. So I will have to give you an update after I try it. The smooth n shine gel is a hair saver. 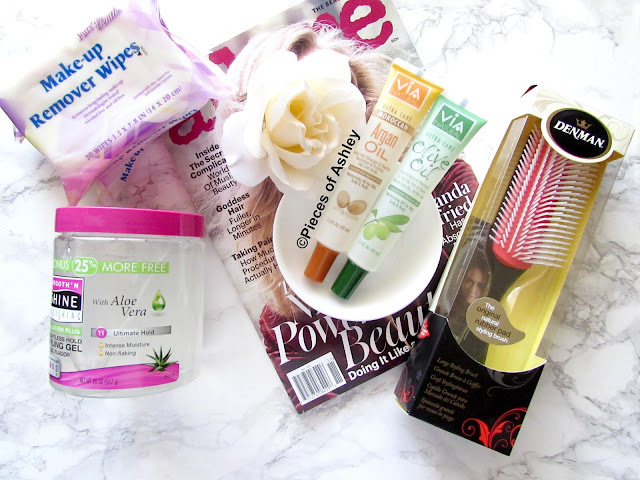 I have thick, coarse and curly hair so finding a product that will supply moisture for my hair is important. This product includes Aloe Vera and it holds my hair very well. This gel does not leave an flakes in my hair, but because I use a leave in conditioner before that my hair gets flaky, when it dries. You can use this on damp or dry hair. I prefer damped in my opinion it's more affective. I had to repurchase this gel, because I only have a little left in my other jar. This is under $4 and the best part is this jar is bigger, so there's more gel! This can also be found at Walmart! I hope you enjoyed reading! If you have any beauty products that you like, let me know. Sharing is caring after all! I love discovering new products! You seem to have found some great bargains, you'll definitely have to update us on the denman brush as I have been thinking of getting one! I will definitely update you on the denman brush! Yeah, the Argan Oil is worth the try! Ooh, I'd quite like to try the Denman brush. I've been using a Tangle Teezer for a good year now, but I've started to notice it's actually tugging my hair like a standard hair brush was! So I'm on the look out for new hair brushes to try!